You first saw their story unfold on an episode of our show. Their rescue had everyone (including us) on the edge of our seats as Tia slid under a huge pile of wooden doors in an abandoned molasses factory to save the terrified pair. According to locals, the two dogs had been running loose in a neighborhood in New Orleans, alluding everyone including animal control. Seeing that they had taken up refuge in the old molasses factory, Tia was able to catch them in under 15 minutes. 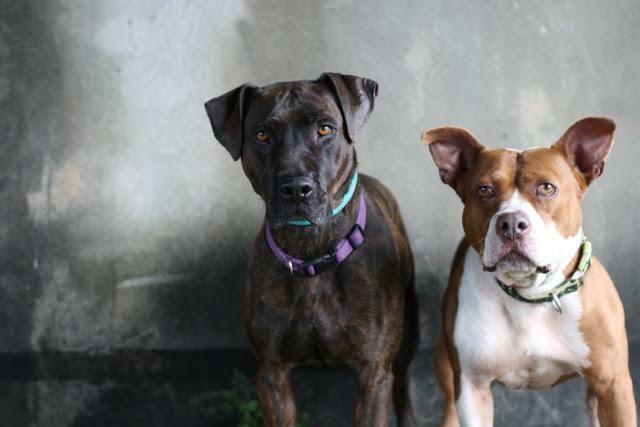 Named “Thick” & “Molasses”, they are a bonded pair. Add to the difficulty of placing them together, Molasses is somewhat shy and will need someone who is very patient. But within a few minutes, Molasses has learned that the once scary humans who used to chase her down on the streets…some are actually pretty nice…well she will end up in your lap.